Is Puffin Population Drop Due To Wetter Summers? 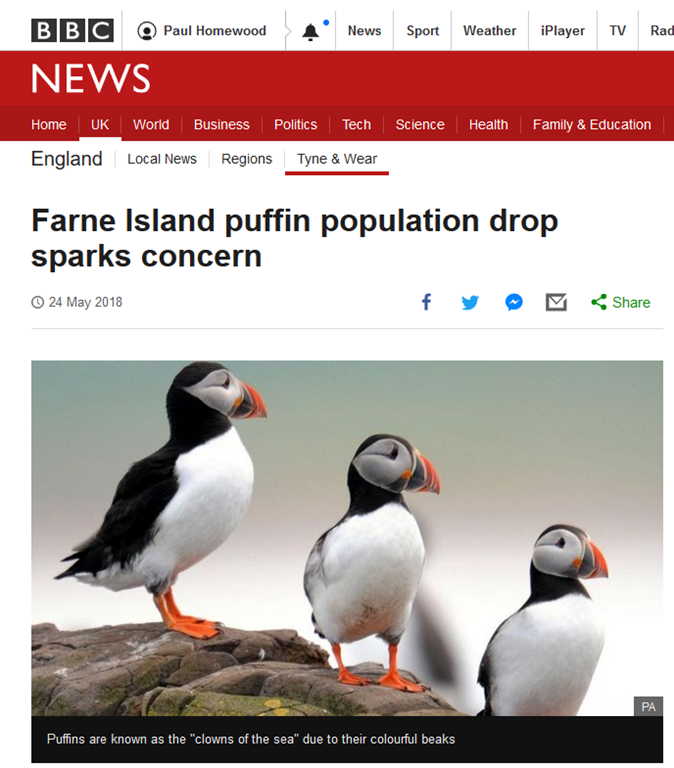 One theory put forward to explain the recent drop in puffin numbers on the Farne Islands is “wetter summers”, which can flood their burrows where the chicks are hatching. 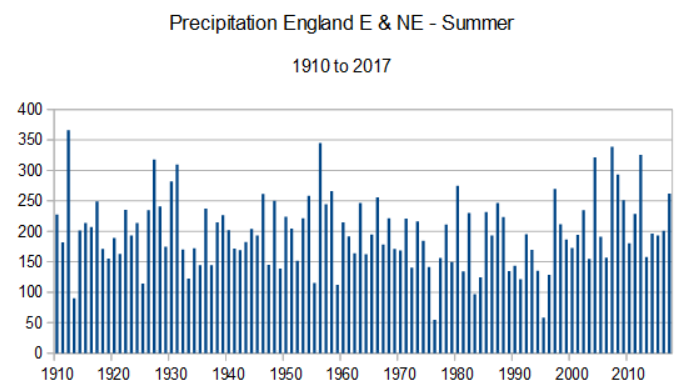 The only really wet summer in the last decade was 2012, but this was not as wet as either 1912 or 1956. In any event, the puffin count in 2013 showed a small increase over the previous one in 2008. 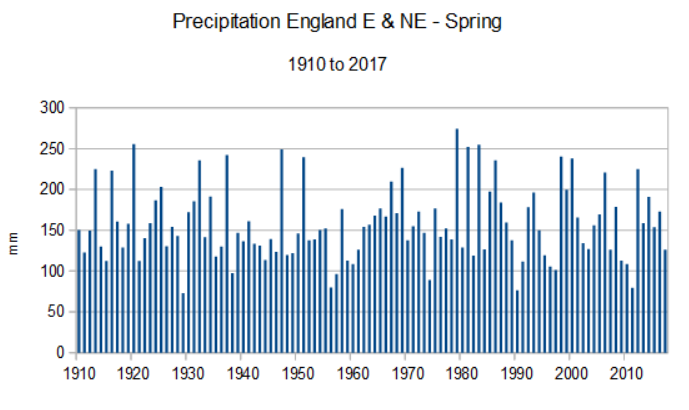 Fortunately for the puffins, rainfall in Spring has not been exceptional in recent years, indeed quite the opposite. The puffin is included on the Amber list of UK Birds of Conservation Concern. It is very vulnerable to adverse changes in the environment because its breeding population is concentrated on a small number of sites. 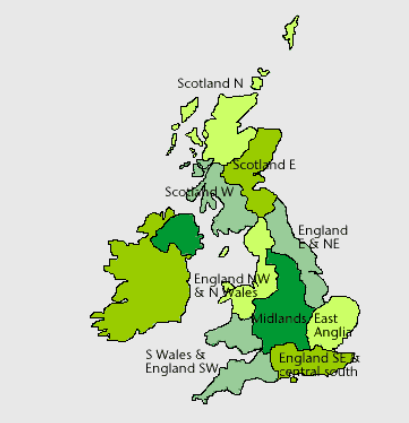 There have also been large population declines over much of its European range. For instance, oil leaked from the Torrey Canyon in 1967 killed 85 per cent of the French puffins. Because of their low reproductive rate, puffins can take decades to recover from this kind of incident. Because the puffin is so widespread, the only realistic conservation measures are sustainable exploitation of the seas, a reduction in incidence of marine pollution, and preventing ground predators reaching nesting colonies. No mention of climate change! Presumably somebody did not read the memo. ← Town Planners To Save World From Global Warming! The RSPB is little different to Greenpiss and all the rest. Scaremongering is a central plank in their ethos. They care little for facts, let alone science. A bit harsh surely? Their comments seem quite sensible to me, and wonderfully free from climate change nonsense, even if they only left it out by mistake, which I don’t think it is fair to assume. About an outfit that repeatedly has supported wind farms and who takes a kick-back from Ruinable energy promoters when the RSPB signs up members to ‘green energy’ tariffs? The fact that they occasionally have opposed a few wind farms is just the rule-proving exception. It isn’t clear whether you are accusing the RSPB or Greenpeace of scaremongering. That’s the trouble with people like you Homewood – insisting on the facts, truth and reality. They just spoil a good story. It must have been an oversite not to mention climate change as a possible cause. Somebody will be in trouble. It depends which bit of the RSPB you’re dealing with, I think, Phillip. I’m generally supportive of the worker bees who get their knees dirty and their heads shat on. The drones who make policy and write press releases not so much. I commented yesterday that given their lifestyle and the difference between summer and winter temperatures, the odd degree difference is not going to be noticeable to your average puffin. Industrial scale hoovering up of sand eels to feed Danish pigs is a different matter. It would be interesting to know who pays the piper for the census because that may well be where the demand to include climate change (check) and this year — of course — plastic pollution (check) has come from. Why do the Daily Telegraph now publish so many ridiculous ‘research’ results without questioning the often questionable conclusions of those research papers? The once reliable DT is now responsible amongst other papers for peddling fake news and in doing so irresponsibly influence the thinking of unthinking masses. A little thought by their sub-editors would quickly show that Puffins have not changed their diet to eating plastic from the sea, and that their late arrival this year could not be put down to global warming, The management of the D.Telegraph should get their act together and stop publishing such silly stories and revert to the standards of reporting for which the newspaper once enjoyed a far higher reputation. +1, George. My dear old mother — a Telegraph reader for as much of her life as I was conscious of — must surely be spinning in her grave! It always used to be that the editorial stance was unashamedly Conservative but that you could rely on the news columns to be accurate and objective. Now it’s a mish-mash of press releases and tabloid voyeurism seasoned with too many second-hand opinions from third-rate columnists (with a couple of decent exceptions!). (with a couple of decent exceptions!). I used to think the same, there are no exceptions – now. This BS is from ‘Bright Blue’, which appears to be the future of the Conservative Party. Heaven help future generations. It is the newspapers like the Daily Telegraph who are putting out all this rubbish without questioning or authenticating the often spurious press releases which reach the journalists desks. Newspapers have to realise that any research carried out by ‘scientific experts’ rarely draw a conclusion that there is ‘no problem’ and nothing to worry about, simply because they need to look forward to their next research grant, and negative results are not good for that, so a problem has to be created, in any case, papers like the DT are not interested in publishing ‘nothing to worry about’ stories. In the meantime we have on the one hand the government now accepting questionable evidence that diesel fumes, after 75 years of vehicles pushing it into the atmosphere without any real proof that it is dangerous to our health, is now a danger to mankind,while another government department is concerned that we are all living a lot longer and that there will be a far greater ‘old age’ percentage of the population in the years to come, with the obvious cost increase in state pensions. They cannot both be right, but the population growing older is indisputable fact, therefore the diesel problem cannot be a serious problem. But along the way, the diesel car industry is decimated through newspapers and the Government accepting very questionable evidence on diesel fumes being dangerous to health. The plastics industry is now going in the same direction with plastic bag manufacturers already going to the wall with the exaggerated claims by the ignorant Green lobby being taken as fact and without question. If everyone that recognizes the media’s lies on such issues would take the trouble to write to them, pointing out their false facts, misrepresentations or outright lies, it might make them a bit more circumspect in future. Lots of Puffins around Skomer yesterday, lovely day in the sun! Birds that lay one egg a year are going to be susceptible to quite large variation in annual numbers. That’s the way numbers work. The whole thing is just another item from an inexhaustible store of obsessive repetitions to be brought out on slow news days. Note that the original DT item was about the Farne Islands, which is a NATIONAL TRUST property – and we know that this institution has recently fallen to the green-blob mob. These days, oil tankers must be fitted with a double hull to minimise the chance of oil escaping in the event of a collision. Hopefully this will have a beneficial effect on the long term trend in sea bird numbers. It does not appear as though we will run out of puffins any time soon. Hang onto Iceland. BTW, Iceland undergoes some interesting fluctuations with all of their volcanic activity. This took typing in “puffin population worldwide” to the Google search. Guess this is why I, the scientist, can find information while the “pseudo-scientists” who populate media and institutions of higher learning cannot. Since we are told that puffins are that “on the edge” constantly I have a question. Why do we still have the puffin as a species? Joan… please stop gathering and using facts. That annoys climate alarmists and you will be judged as “in denial”…or worse. You are too late. I had a colleague botanical leader at the West Virginia Wildflower Pilgrimage shout that at me about 4 years ago when I told him man-caused climate change was a hoax. These climate concern people are spreading their so-called concern way too thinly. Most of it is just huffin’ and puffin’. I wonder if Paul could have a look at what seems to be another alarmist story about wildlife in today’s Daily Telegraph. It claims that wildlife that turn white in the winter in Poland and Eastern Europe are threatened by snow cover being halved in the last 15 years or so! I have seen Paul rubbish similar claims convincingly elsewhere and I wonder if this is just more dishonesty being advanced by people who know that they won’t be challenged. I see that Paul has now started a thread on them poor weasels. My guess as to how the DT scare-story du jour would be written was mainly right, even to the exact “trigger words,” but the writer forgot to include “computer models” – so it was a rather inferior item from the journalistic sewer. Over the long term, snow in Poland seems to depend on the North Atlantic Oscillation. Over the years and though I am no twitcher, Id rather eat guano than join the RSPB but I take a pair of field glasses and occasionally get to Bempton, well somewhere on the East coast, Lakes, N.Wales, Morecambe flats, wherever takes my fancy. Over the years, the populations of Gannets, Guillemots, Herring Gulls et al Puffins too have risen and fallen in relative numbers, the key determinant being food (hell no?) and to a lesser extent is determined by weather the major factor EU (Danish) vessels hoovering the sea bed and overfishing by others (Frogs, Spanish) the marine pelagic species to virtual extinction. I don’t doubt that minor weather fluctuations do play a part in bird numbers, however man and removing the sea of the food chain for fish and trawling particularly dragnet should I call it destruction – is the major factor on our feathered friends populations.